Can adults with autism live independent lives? What hope does reasearch offer? The National Institute of Mental Health (NIMH), the Federal agency that conducts and supports research on mental and brain disorders, including autism, writes this article. NIMH is part of the National Institutes of Health (NIH), which is the Federal Government's primary agency for biomedical and behavioral research. The National Institute of Child Health and Human Development (NICHD), National Institute on Deafness and Other Communication Disorders (NIDCD), and National Institute of Neurological Disorders and Stroke (NINDS), also sponsor research on autism and related disorders. NIMH scientists are dedicated to understanding the workings and interrelationships of the various regions of the brain, and to developing preventive measures and new treatments for disorders like autism that handicap people in school, work, and social relationships. Up-to-date information on autism and the role of NIMH in identifying underlying causes and effective treatments are included in this pamphlet. Also described are symptoms and diagnostic procedures, treatment options, strategies for coping, and sources of information and support. The individuals referred to in this brochure are not real, but their stories are based on interviews with parents who have children with autism. Paul has always been obsessed with order. As a child, he lined up blocks, straightened chairs, kept his toothbrush in the exact same spot on the sink, and threw a tantrum when anything was moved. Paul could also become aggressive. Sometimes, when upset or anxious, he would suddenly explode, throwing a nearby object or smashing a window. When overwhelmed by noise and confusion, he bit himself or picked at his nails until they bled. At school, where his schedule and environment could be carefully structured, his behavior was more normal. But at home, amid the unpredictable, noisy hubbub of a large family, he was often out of control. His behavior made it harder and harder for his parents to care for him at home and also meet their other children's needs. At that time-more than 10 years ago-much less was known about the disorder and few therapeutic options were available. So, at age 9, his parents placed him in a residential program where he could receive 24-hour supervision and care. As an infant, Alan was playful and affectionate. At 6 months old, he could sit up and crawl. He began to walk and say words at 10 months and could count by 13 months. One day, in his 18th month, his mother found him sitting alone in the kitchen, repeatedly spinning the wheels of her vacuum cleaner with such persistence and concentration, he didn't respond when she called. From that day on, she recalls, "It was as if someone had pulled a shade over him." He stopped talking and relating to others. He often tore around the house like a demon. He became fixated on electric lights, running around the house turning them on and off. When made to stop, he threw a tantrum, kicking and biting anyone within reach. From the day she was born, Janie seemed different from other infants. At an age when most infants enjoy interacting with people and exploring their environment, Janie sat motionless in her crib and didn't respond to rattles or other toys. She didn't seem to develop in the normal sequence, either. She stood up before she crawled, and when she began to walk, it was on her toes. By 30 months old, she still wasn't talking. Instead, she grabbed things or screamed to get what she wanted. She also seemed to have immense powers of concentration, sitting for hours looking at a toy in her hand. When Janie was brought to a special clinic for evaluation, she spent an entire testing session pulling tufts of wool from the psychologist's sweater. NOTE: This list is not intended to be used to assess whether a particular child has autism. Diagnosis should only be done by a specialist using highly detailed background information and behavioral observations. Some people with autism also tend to be physically aggressive at times, making social relationships still more difficult. Some lose control, particularly when they're in a strange or overwhelming environment, or when angry and frustrated. They are capable at times of breaking things, attacking others, or harming themselves. Alan, for example, may fall into a rage, biting and kicking when he is frustrated or angry. Paul, when tense or overwhelmed, may break a window or throw things. Others are self-destructive, banging their heads, pulling their hair, or biting their arms. Some children say the same phrase in a variety of different situations. One child, for example, says, "Get in the car," at random times throughout the day. While on the surface, her statement seems bizarre, there may be a meaningful pattern in what the child says. The child may be saying, "Get in the car," whenever she wants to go outdoors. In her own mind, she's associated "Get in the car," with leaving the house. Another child, who says "Milk and cookies" whenever he is pleased, may be associating his good feelings around this treat with other things that give him pleasure. It can be equally difficult to understand the body language of a person with autism. Most of us smile when we talk about things we enjoy, or shrug when we can't answer a question. But for children with autism, facial expressions, movements, and gestures rarely match what they are saying. Their tone of voice also fails to reflect their feelings. A high-pitched, singsong, or flat, robot-like voice is common. Temple Grandin, despite a lifelong struggle with autism, earned a doctoral degree in animal science. Today, she invents equipment for managing livestock and teaches at a major university. A woman of extraordinary accomplishments, she has also written several books on animal science, autism, and her own life. Yet at 6 months old, Temple had many of the full-blown signs of autism. When held, she would stiffen and struggle to be put down. By age 2, it was clear that she was hypersensitive to taste, sound, smell, and touch. Sounds were excruciating. Wearing clothes was torture: the feel of certain fabrics was like sandpaper grating her skin. Constantly buffeted by overpowering sensations, she screamed, raged, and threw things. At other times, she found that by focusing intently and exclusively on one item-her own hand, an apple, a spinning coin, or sand sifting through her fingers-she could withdraw into a temporary haven of order and predictability. As was customary at the time, a doctor advised that Temple be institutionalized. Her mother refused and placed her in a therapeutic program for children who were speech impaired. The classes were small and highly structured. Even though the program was not designed to treat autism, the methods worked for Temple. By age 4, she began to speak and by age 5 she was able to attend kindergarten in a regular school. Temple attributes her success to several key people in her life: her mother, who persisted in finding help; her therapist, who kept her from withdrawing into an inner world; and a high school teacher who helped transform her interest in animals into a career in animal science. Temple's insights into the needs of animals, a strongly developed ability to think visually "in pictures," and an awareness of her own special needs led her to invent equipment that has helped both livestock and, remarkably, herself. After seeing a device used to calm cattle, she created a "squeeze machine." The machine provides self- controlled pressure that helps her relax. She finds that after using the squeeze machine, she feels less aggressive and less hypersensitive. With her love of animals and her personal sensitivity as a guide, Temple has also designed humane equipment and facilities for managing cattle that are used all over the world. Her unusually strong visual sense allows her to plan and design these complex projects in her head. She can precisely envision new, complex facilities and how various pieces of equipment fit together before she draws a blueprint. Temple Grandin's story is a powerful affirmation that autism need not keep people from realizing their potential. Even so, years may go by before the family seeks a diagnosis. Well-meaning friends and relatives sometimes help parents ignore the problems with reassurances that "Every child is different," or "Janie can talk-she just doesn't want to!" Unfortunately, this only delays getting appropriate assessment and treatment for the child. To date, there are no medical tests like x-rays or blood tests that detect autism. And no two children with the disorder behave the same way. In addition, several conditions can cause symptoms that resemble those of autism. So parents and the child's pediatrician need to rule out other disorders, including hearing loss, speech problems, mental retardation, and neurological problems. But once these possibilities have been eliminated, a visit to a professional who specializes in autism is necessary. Such specialists include people with the professional titles of child psychiatrist, child psychologist, developmental pediatrician, or pediatric neurologist. Autism specialists use a variety of methods to identify the disorder. Using a standardized rating scale, the specialist closely observes and evaluates the child's language and social behavior. A structured interview is also used to elicit information from parents about the child's behavior and early development. Reviewing family videotapes, photos, and baby albums may help parents recall when each behavior first occurred and when the child reached certain developmental milestones. The specialists may also test for certain genetic and neurological problems. Differences in neurotransmitters, the chemical messengers of the nervous system, are also being explored. For example, high levels of the neurotransmitter serotonin have been found in a number of people with autism. Since neurotransmitters are responsible for passing nerve impulses in the brain and nervous system, it is possible that they are involved in the distortion of sensations that accompanies autism. NIMH grantees are also exploring differences in overall brain function, using a technology called magnetic resonance imaging (MRI) to identify which parts of the brain are energized during specific mental tasks. In a study of adolescent boys, NIMH researchers observed that during problem-solving and language tasks, teenagers with autism were not only less successful than peers without autism, but the MRI images of their brains showed less activity. 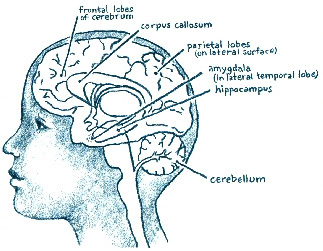 In a study of younger children, researchers observed low levels of activity in the parietal areas and the corpus callosum. Such research may help scientists determine whether autism reflects a problem with specific areas of the brain or with the transmission of signals from one part of the brain to another. It appears that parents who have one child with autism are at slightly increased risk for having more than one child with autism. This also suggests a genetic link. However, autism does not appear to be due to one particular gene. If a single gene passed along autism, like eye color, more family members would inherit the disorder. NIMH grantees, using state-of-the-art gene splicing techniques, are searching for irregular segments of genetic code that the autistic members of a family may have inherited. A body of NIMH-sponsored research is testing this theory. One study is exploring whether parents and siblings who do not have autism show minor symptoms, such as mild social, language, or reading problems. If so, such findings would suggest that several members of a family can inherit the irregular or unstable genes, but that other as yet unidentified conditions must be present for the full-blown disorder to develop. Several disorders commonly accompany autism. To some extent, these may be caused by a common underlying problem in brain functioning. Of the problems that can occur with autism, mental retardation is the most widespread. Seventy-five to 80 percent of people with autism are mentally retarded to some extent. Fifteen to 20 percent are considered severely retarded, with IQs below 35. (A score of 100 represents average intelligence.) But autism does not necessarily correspond with mental impairment. More than 10 percent of people with autism have an average or above average IQ. A few show exceptional intelligence. Interpreting IQ scores is difficult, however, because most intelligence tests are not designed for people with autism. People with autism do not perceive or relate to their environment in typical ways. When tested, some areas of ability are normal or even above average, and some areas may be especially weak. For example, a child with autism may do extremely well on the parts of the test that measure visual skills but earn low scores on the language subtests. About one-third of the children with autism develop seizures, starting either in early childhood or adolescence. Researchers are trying to learn if there is any significance to the time of onset, since the seizures often first appear when certain neurotransmitters become active. Since seizures range from brief blackouts to full-blown body convulsions, an electroencephalogram (EEG) can help confirm their presence. Fortunately, in most cases, seizures can be controlled with medication. One disorder, Fragile X syndrome, has been found in about 10 percent of people with autism, mostly males. This inherited disorder is named for a defective piece of the X-chromosome that appears pinched and fragile when seen under a microscope. People who inherit this faulty bit of genetic code are more likely to have mental retardation and many of the same symptoms as autism along with unusual physical features that are not typical of autism. There is also some relationship between autism and Tuberous Sclerosis, a genetic condition that causes abnormal tissue growth in the brain and problems in other organs. Although Tuberous Sclerosis is a rare disorder, occurring less than once in 10,000 births, about a fourth of those affected are also autistic. Scientists are exploring genetic conditions such as Fragile X and Tuberous Sclerosis to see why they so often coincide with autism. Understanding exactly how these conditions disrupt normal brain development may provide insights to the biological and genetic mechanisms of autism. Adolescence was a good time for Paul. He seemed to relax and become more social. He became more affectionate. When approached, he would converse with people. For several months, drugs were used to help him control his aggression, but they were stopped because they caused unwanted side effects. Even so, he now rarely throws or breaks things. Two years ago, Paul's parents were able to take advantage of new scientific understanding about autism, and they enrolled him in an innovative program that provides full-time support, enabling him to live and work within the community. Today, at age 20, he has a closely supervised job assembling booklets for a publishing company. He lives in an attractive apartment with another man who has autism and a residence supervisor. Paul loves picnics and outings to the library to check out books and cassettes. He also enjoys going home each week to visit his family. But he still demands familiarity and order. As soon as he arrives home, he moves every piece of furniture back to the location that is familiar to him. The summer Alan was 6, after years with no apparent progress, his language began to flow. Although he reversed the meaning of pronouns, he began talking in sentences that other people could understand. Now age 13, Alan has lost his constant obsession with lights, returning to it only when he feels stressed. He often burrows under a heavy pile of pillows, which seems to relax and comfort him. His fits of anger occur less often, but because he is bigger, he reacts with more force. Every now and then, he goes out of control, kicking, hitting, and biting. Once, at a shopping mall, he threw a tantrum so severe that his mother had to hold him down to control him. At the same time, he has successfully made the transition to middle school and he is learning more quickly than before. He seems more aware of his surroundings and remembers people. He still doesn't play with other children, but often sits watching them from a window. It's as if he has become aware that he is different. He also seems more aware of his own emotions and at times he says quietly, "You sad." Today, at age 4, Janie is enrolled in an intensive program in which she is trained at home by her mother and several specialists. She is beginning to show real progress. She now makes eye contact and has begun to talk. She can ask for things. As a result, she seems happier, less frustrated, and better able to form connections with others. She's also begun to show some remarkable skills. She can stack blocks and match objects far beyond her years. And her memory is amazing. Although her speech is often unclear, she can recite and act out entire television programs. Her parents' dream is that she will progress enough to enter a regular kindergarten next year. When parents learn that their child is autistic, most wish they could magically make the problem go away. They looked forward to having a baby and watching their child learn and grow. Instead, they must face the fact that they have a child who may not live up to their dreams and will daily challenge their patience. Some families deny the problem or fantasize about an instant cure. They may take the child from one specialist to another, hoping for a different diagnosis. It is important for the family to eventually overcome their pain and deal with the problem, while still cherishing hopes for their child's future. Most families realize that their lives can move on. Today, more than ever before, people with autism can be helped. A combination of early intervention, special education, family support, and in some cases, medication, is helping increasing numbers of children with autism to live more normal lives. Special interventions and education programs can expand their capacity to learn, communicate, and relate to others, while reducing the severity and frequency of disruptive behaviors. Medications can be used to help alleviate certain symptoms. Older children and adults like Paul may also benefit from the treatments that are available today. So, while no cure is in sight, it is possible to greatly improve the day-to-day life of children and adults with autism. Today, a child who receives effective therapy and education has every hope of using his or her unique capacity to learn. Even some who are seriously mentally retarded can often master many self-help skills like cooking, dressing, doing laundry, and handling money. For such children, greater independence and self-care may be the primary training goals. Other youngsters may go on to learn basic academic skills, like reading, writing, and simple math. Many complete high school. Some, like Temple Grandin, may even earn college degrees. Like anyone else, their personal interests provide strong incentives to learn. Clearly, an important factor in developing a child's long-term potential for independence and success is early intervention. The sooner a child begins to receive help, the more opportunity for learning. Furthermore, because a young child's brain is still forming, scientists believe that early intervention gives children the best chance of developing their full potential. Even so, no matter when the child is diagnosed, it's never too late to begin treatment. Researchers have begun to identify factors that make certain treatment programs more effective in reducing- or reversing-the limitations imposed by autism. Treatment programs that build on the child's interests, offer a predictable schedule, teach tasks as a series of simple steps, actively engage the child's attention in highly structured activities, and provide regular reinforcement of behavior, seem to produce the greatest gains. Parent involvement has also emerged as a major factor in treatment success. Parents work with teachers and therapists to identify the behaviors to be changed and the skills to be taught. Recognizing that parents are the child's earliest teachers, more programs are beginning to train parents to continue the therapy at home. Research is beginning to suggest that mothers and fathers who are trained to work with their child can be as effective as professional teachers and therapists. In one developmental preschool classroom, a typical session starts with a physical activity to help develop balance, coordination, and body awareness. Children string beads; piece puzzles together, paint and participate in other structured activities. At snack time, the teacher encourages social interaction and models how to use language to ask for more juice. Later, the teacher stimulates creative play by prompting the children to pretend being a train. As in any classroom, the children learn by doing. However, some researchers and therapists believe that less intensive treatments, particularly those begun early in a child's life, may be more efficient and just as effective. So, over the years, researchers sponsored by NIMH and other agencies have continued to study and modify the behaviorist approach. Today, some of these behaviorist treatment programs are more individualized and built around the child's own interests and capabilities. Many programs also involve parents or other non-autistic children in teaching the child. Instruction is no longer limited to a controlled environment, but takes place in natural, everyday settings. Thus, a trip to the supermarket may be an opportunity to practice using words for size and shape. Although rewarding desired behavior is still a key element, the rewards are varied and appropriate to the situation. A child who makes eye contact may be rewarded with a smile, rather than candy. NIMH is funding several types of behaviorist treatment approaches to help determine the best time for treatment to start, the optimum treatment intensity and duration, and the most effective methods to reach both high- and low-functioning children. It is critical that parents obtain reliable, objective information before enrolling their child in any treatment program. Programs that are not based on sound principles and tested through solid research can do more harm than good. They may frustrate the child and cause the family to lose money, time, and hope. Parents are often disappointed to learn that there is no single best treatment for all children with autism. Even after a child has been thoroughly tested and formally diagnosed, there is no clear "right" course of action. The diagnostic team may suggest treatment methods and service providers, but ultimately it is up to the parents to consider their child's unique needs, research the various options, and decide. At the back of this pamphlet is a list of books and associations that provide more detailed information about each form of therapy and other resources. How is progress measured? Will my child's behavior be closely observed and recorded? No medication can correct the brain structures or impaired nerve connections that seem to underlie autism. Scientists have found, however, that drugs developed to treat other disorders with similar symptoms are sometimes effective in treating the symptoms and behaviors that make it hard for people with autism to function at home, school, or work. It is important to note that the Food and Drug Administration (FDA) have approved none of the medications described in this section for autism. The FDA is the Federal agency that authorizes the use of drugs for specific disorders. Medications used to treat anxiety and depression are being explored as a way to relieve certain symptoms of autism. These drugs include fluoxetine (Prozac), fluvoxamine (Luvox), sertraline (Zoloft), and clomipramine (Anafranil). Some scientists believe that autism and these disorders may share a problem in the functioning of the neurotransmitter serotonin, which these medications apparently help. One study found that about 60 percent of patients with autism who used fluoxetine became less distraught and aggressive. They became calmer and better able to handle changes in their routine or environment. However, fenfluramine, another medication that affects serotonin levels, has not proven to be helpful. People with an anxiety disorder called obsessive-compulsive disorder (OCD), like people with autism, are plagued by repetitive actions they can't control. Based on the premise that the two disorders may be related, one NIMH research study found that clomipramine, a medication used to treat OCD, does appear to be effective in reducing obsessive, repetitive behavior in some people with autism. Children with autism who were given the medication also seemed less withdrawn, angry, and anxious. But more research needs to be done to see if the findings of this study can be repeated. Some children with autism experience hyperactivity, the frenzied activity that is seen in people with attention deficit hyperactivity disorder (ADHD). Since stimulant drugs like Ritalin are helpful in treating many people with ADHD, doctors have tried them to reduce the hyperactivity sometimes seen in autism. The drugs seem to be most effective when given to higher-functioning children with autism who do not have seizures or other neurological problems. Because many children with autism have sensory disturbances and often seem impervious to pain, scientists are also looking for medications that increase or decrease the transmission of physical sensations. Endorphins are natural painkillers produced by the body. But in certain people with autism, the endorphins seem to go too far in suppressing feeling. Scientists are exploring substances that block the effects of endorphins, to see if they can bring the sense of touch to a more normal range. Such drugs may be helpful to children who experience too little sensation. And once they can sense pain, such children could be less likely to bite themselves, bang their heads, or hurt themselves in other ways. Chlorpromazine, theoridazine, and haloperidol have also been used. Although these powerful drugs are typically used to treat adults with severe psychiatric disorders, they are sometimes given to people with autism to temporarily reduce agitation, aggression, and repetitive behaviors. However, since major tranquilizers are powerful medications that can produce serious and sometimes permanent side effects, they should be prescribed and used with extreme caution. Vitamin B6, taken with magnesium, is also being explored as a way to stimulate brain activity. Because vitamin B6 plays an important role in creating enzymes needed by the brain, some experts predict that large doses might foster greater brain activity in people with autism. However, clinical studies of the vitamin have been inconclusive and further study is needed. Like drugs, vitamins change the balance of chemicals in the body and may cause unwanted side effects. For this reason, large doses of vitamins should only be given under the supervision of a doctor. This is true of all vitamins and medications. The Individuals with Disabilities Education Act of 1990 assures a free and appropriate public education to children with diagnosed learning deficits. The 1991 version of the law extended services to preschoolers who are developmentally delayed. As a result, public schools must provide services to handicapped children including those age 3 to 5. Because of the importance of early intervention, many states also offer special services to children from birth to age 3. The school may also be responsible for providing whatever services are needed to enable the child to attend school and learn. Such services might include transportation, speech therapy, occupational therapy, and any special equipment. Federally funded Parent Training Information Centers and Protection and Advocacy Agencies in each state can provide information on the rights of the family and child. By law, public schools are also required to prepare and carry out a set of specific instructional goals for every child in a special education program. The goals are stated as specific skills that the child will be taught to perform. The list of skills make up what is known as an "IEP"-the child's Individualized Educational Program. The IEP serves as an agreement between the school and the family on the educational goals. Because parents know their child best, they play an important role in creating this plan. They work closely with the school staff to identify which skills the child needs most. In planning the IEP, it's important to focus on what skills are critical to the child's well-being and future development. For each skill, parents and teachers should consider these questions: Is this an important life skill? What will happen if the child isn't trained to do this for herself? Such questions free parents and teachers to consider alternatives to training. After several years of valiant effort to teach Alan to tie his shoelaces, his parents and teachers decided that Alan could simply wear sneakers with Velcro fasteners, and dropped the skill from Alan's IEP. After Alan struggled in vain to memorize the multiplication table, they decided to teach him to use a calculator. A child's success in school should not be measured against standards like mastering algebra or completing high school. Rather, progress should be measured against his or her unique potential for self-care and self-sufficiency as an adult. For all children, adolescence is a time of stress and confusion. No less so for teenagers with autism. Like all children, they need help in dealing with their budding sexuality. While some behaviors improve in the teenage years, some get worse. Increased autistic or aggressive behavior may be one way some teens express their newfound tension and confusion. The teenage years are also a time when children become more socially sensitive and aware. At the age that most teenagers are concerned with acne, popularity, grades, and dates, teens with autism may become painfully aware that they are different from their peers. They may notice that they lack friends. And unlike their schoolmates, they aren't dating or planning for a career. For some, the sadness that comes with such realization urges them to learn new behaviors. Sean Barron, who wrote about his autism in the book, There's a Boy in Here, describes how the pain of feeling different motivated him to acquire more normal social skills. At present, there is no cure for autism. Nor do children outgrow it. But the capacity to learn and develop new skills is within every child. With time, children with autism mature and new strengths emerge. Many children with autism seem to go through developmental spurts between ages 5 and 13. Some spontaneously begin to talk-even if repetitively-around age 5 or later. Other children, like Paul, may become more sociable, or like Alan, more ready to learn. Over time, and with help, children may learn to play with toys appropriately, function socially, and tolerate mild changes in routine. Some children in treatment programs lose enough of their most disabling symptoms to function reasonably well in a regular classroom. Some children with autism make truly dramatic strides. Of course, those with normal or near-normal intelligence and those who develop language tend to have the best outcomes. But even children who start off poorly may make impressive progress. For example, one boy, after 9 years in a program that involved parents as co-therapists, advanced from an IQ of 70 to an IQ of 100 and began to get average grades at a regular school. While it is natural for parents to hope that their child will "become normal," they should take pride in whatever strides their child does make. Many parents, looking back over the years, find their child has progressed far beyond their initial expectations. The majority of adults with autism need lifelong training, ongoing supervision, and reinforcement of skills. The public schools' responsibility for providing these services ends when the person is past school age. As the child becomes a young adult, the family is faced with the challenge of creating a home-based plan or selecting a program or facility that can offer such services. In some cases, adults with autism can continue to live at home, provided someone is there to supervise at all times. A variety of residential facilities also provide round-the-clock care. Unlike many of the institutions years ago, today's facilities view residents as people with human needs, and offer opportunities for recreation and simple, but meaningful work. Still, some facilities are isolated from the community, separating people with autism from the rest of the world. Today, a few cities are exploring new ways to help people with autism hold meaningful jobs and live and work within the wider community. Innovative, supportive programs enable adults with autism to live and work in mainstream society, rather than in a segregated environment. By teaching and reinforcing good work skills and positive social behaviors, such programs help people live up to there potential. Work is meaningful and based on each person's strengths and abilities. For example, people with autism with good hand-eye coordination who do complex, repetitive actions are often especially good at assembly and manufacturing tasks. A worker with a low IQ and few language skills might be trained to work in a restaurant sorting silverware and folding napkins. Adults with higher-level skills have been trained to assemble electronic equipment or do office work. Based on their skills and interests, participants in such programs fill positions in printing, retail, clerical, manufacturing, and other companies. Once they are carefully trained in a task, they are put to work alongside the regular staff. Like other employees, they are paid for their labor, receive employee benefits, and are included in staff events like company picnics and retirement parties. Companies that hire people through such programs find that these workers make loyal, reliable employees. Employers find that the autistic behaviors, limited social skills, and even occasional tantrums or aggression, do not greatly affect the worker's ability to work efficiently or complete tasks. Like any other worker, program participants live in houses and apartments within the community. Under the direction of a residence coach, each resident shares as much as possible in tasks like meal planning, shopping, cooking, and cleanup. For recreation, they go to movies, have picnics, and eat in restaurants. As they are ready, they are taught skills that make them more personally independent. Some take pride in having learned to take a bus on their own, or handling money they've earned themselves. Job and residence coaches, who serve as a link between the program participants and the community, are the key to such programs. There may be as few as two adults with autism assigned to each coach. The job coach demonstrates the steps of a job to the worker, observes behavior, and regularly acknowledges good performance. The job coach also serves as a bridge between the workers with autism and their co-workers. For example, the coach steps in if a worker loses self-control or presents any problems on the job. The coach also provides training in specific social skills, such as waving or saying hello to fellow workers. At home, the residence coach reinforces social and self-help behaviors, and finds ways to help people manage their time and responsibilities. At present, about a third of all people with autism can live and work in the community with some degree of independence. As scientific research points the way to more effective therapies and as communities establish programs that provide proper support, expectations are that this number will grow. The task of rearing a child with autism is among the most demanding and stressful that a family faces. The child's screaming fits and tantrums can put everyone on edge. Because the child needs almost constant attention, brothers and sisters often feel ignored or jealous. Younger children may need to be reassured that they will not catch autism or grow to become like their sibling. Older children may be concerned about the prospect of having a child with autism themselves. The tensions can strain a marriage. While friends and family may try to be supportive, they can't understand the difficulties in raising a child with autism. They may criticize the parents for letting their child "get away" with certain behaviors and announce how they would handle the child. Some parents of children with autism feel envious of their friends' children. This may cause them to grow distant from people who once gave them support. Families may also be uncomfortable taking their child to public places. Children who throw tantrums, walk on their toes, flail their arms, or climb under restaurant tables to play with strangers' socks, can be very embarrassing. Janie's mother found that once she became willing to explain to strangers that her child has autism, people were more accepting. Paul's mother has learned to remind herself, "This is a public place. We have a right to be here." Many parents feel deeply disappointed that their child may never engage in normal activities or attain some of life's milestones. Parents may mourn that their child may never learn to play baseball, drive, get a diploma, marry, or have children. However, most parents come to accept these feelings and focus on helping their children achieve what they can. Parents begin to find joy and pleasure in their child despite the limitations. Many parents find that others who face the same concerns are their strongest allies. Parents of children with autism tend to form communities of mutual caring and support. Parents gain not only encouragement and inspiration from other families' stories, but also practical advice, information on the latest research, and referrals to community services and qualified professionals. By talking with other people who have similar experiences, families dealing with autism learn they are not alone. The Autism Society of America, listed at the close of this article, has spawned parent support groups in communities across the country. In such groups, parents share emotional support, affirmation, and suggestions for solving problems. Its newsletter, the Advocate, is filled with up-to-date medical and practical information. The following suggestions are based on the experiences of families in dealing with autism, and on NIMH-sponsored studies of effective strategies for dealing with stress. Work as a family. In times of stress, family members tend to take their frustrations out on each other when they most need mutual support. Despite the difficulties in finding childcare, couples find that taking breaks without their children helps renew their bonds. The other children also need attention, and need to have a voice in expressing and solving problems. Keep a sense of humor. Parents find that the ability to laugh and say, "You won't believe what our child has done now!" helps them maintain a healthy sense of perspective. Notice progress. When it seems that all the help, love, and support is going nowhere, it's important to remember that over time, real progress is being made. Families are better able to maintain their hope if they celebrate the small signs of growth and change they see. Take action. Many parents gain strength working with others on behalf of all children with autism. Working to win additional resources, community programs, or school services helps parents see themselves as important contributors to the well-being of others as well as their own child. Plan ahead. Naturally, most parents want to know that when they die, their offspring will be safe and cared for. Having a plan in place helps relieve some of the worry. Some parents form a contract with a professional guardian, who agrees to look after the interests of the person with autism, such as observing birthdays and arranging for care. Research continues to reveal how the brain-the control center for thought, language, feelings, and behavior-carries out its functions. The National Institute of Mental Health (NIMH) funds scientists at centers across the Nation who are exploring how the brain develops, transmits its signals, integrates input from the senses, and translates all this into thoughts and behavior. In recognition of growing scientific gains in brain research, the President and Congress have officially designated the 1990s as the "Decade of the Brain." There are new research initiatives at NIH sponsored by NIMH, NICHD, NINDS, and NIDCD. As a result, today as never before, investigators from various scientific disciplines are joining forces to unlock the mysteries of the brain. Perspective gained from research into the genetic, biochemical, physiological, and psychological aspects of autism may provide a more complete view of the disorder. Every day, NIH-sponsored researchers are learning more about how the brain develops normally and what can go wrong in the process. Already, for example, scientists have discovered evidence suggesting that in autism, brain development slows at some point before week 30 of pregnancy. Scientists now also have tools and techniques that allow them to examine the brain in ways that were unthought of just a few years ago. New imaging techniques that show the living brain in action permit scientists to observe with surprising clarity how the brain changes as an individual performs mental tasks, moves, or speaks. Such techniques open windows to the brain, allowing scientists to learn which brain regions are engaged in particular tasks. In addition, recent scientific advances are permitting scientists to break new ground in researching the role of heredity in autism. Using sophisticated statistical methods along with gene splicing-a technique that enables scientists to manipulate the microscopic bits of genetic code-investigators sponsored by NIH and other institutions are searching for abnormal genes that may be involved in autism. The ability to identify irregular genes-or the factors that make a gene unstable-may lead to earlier diagnoses. Meanwhile, scientists are working to determine if there is a genetic link between autism and other brain disorders commonly associated with it, such as Tourette Disorder and Tuberous Sclerosis. New insights into the genetic transmission of these disorders, along with newly gained knowledge of normal and abnormal brain development should provide important clues to the causes of autism. A key to developing our understanding of the human brain is research involving animals. Like humans, other primates, such as chimpanzees, apes, and monkeys, have emotions, form attachments, and develop higher-level thought processes. For this reason, studies of their brain functions and behavior shed light on human development. Animal studies have proven invaluable in learning how disruptions to the developing brain affect behavior, sensory perceptions, and mental development and have led to a better understanding of autism. Ultimately, the results of NIMH's extensive research program may translate into better lives for people with autism. As we get closer to understanding the brain, we approach a day when we may be able to diagnose very young children and provide effective treatment earlier in the child's development. As data accumulate on the brain chemicals involved in autism, we get closer to developing medications that reduce or reverse imbalances. Someday, we may even have the ability to prevent the disorder. Perhaps researchers will learn to identify children at risk for autism at birth, allowing doctors and other health care professionals to provide preventive therapy before symptoms ever develop. Or, as scientists learn more about the genetic transmission of autism, they may be able to replace any defective genes before the infant is even born. Parents often find that books and movies about autism that have happy endings cheer them, but raise false hopes. In such stories, a parent's novel approach suddenly works or the child simply outgrows the autistic behaviors. But there really are no cures for autism and growth takes time and patience. Parents should seek practical, realistic sources of information, particularly those based on careful research. Similarly, certain sources of information are more reliable than others. Some popular magazines and newspapers are quick to report new "miracle cures" before they have been thoroughly researched. Scientific and professional materials, such as those published by the Autism Society of America and other organizations that take the time to thoroughly evaluate such claims, provide current information based on well-documented data and carefully controlled clinical research. The following resources provide a good starting point for gaining insight, practical information, and support. Further information on autism can be found at libraries, book stores, and local chapters of the Autism Society of America. Baron-Cohen, S., and Bolton, B. Autism: The Facts. New York: Oxford University Press, 1993. Harris, S., and Handelman, J. eds. Preschool Programs for Children with Autism. Austin, TX: PRO-ED, 1993. Hart, C. A Parent's Guide to Autism, New York: Simon & Schuster, Pocket Books, 1993. Lovaas, O. Teaching Developmentally Disabled Children: The ME Book. Austin, TX: PRO-ED, 1981. May, J. Circles of Care and Understanding: Support Groups for Fathers of Children with Special Needs. Bethesda, MD: Association for the Care of Children's Health, 1993. Powers, M. Children with Autism: A Parents' Guide. Rockville, MD: Woodbine House, 1989. Sacks, O. An Anthropologist on Mars. New York: Knopf, 1995. Advocacy Manual: A Parent's How-to Guide for Special Education Services. Pittsburgh: Learning Disabilities Association of America, 1992. Directory for Exceptional Children: A Listing of Educational and Training Facilities. Boston: Porter Sargent Publications, 1994. Pocket Guide to Federal Help for Individuals with Disabilities. Pueblo, CO: U. S. Government Printing Office, Consumer Information Center. Amenta, C. Russell is Extra Special. New York: Magination Press, 1992. Gold, P. Please Don't Say Hello. New York: Human Sciences Press/Plenum Publications, 1986. Katz, I., and Ritvo, E. Joey and Sam. Northridge, CA: Real Life Storybooks, 1993. Aarons, M., and Gittens, T. The Handbook of Autism. A Guide for Parents and Professionals. New York: Tavistock/Routledge, 1992. American Psychiatric Association. Diagnostic and Statistical Manual of Mental Disorders, Fourth Edition. Washington, D.C.: American Psychiatric Association, 1994. Groden, G., and Baron, M., eds. Autism: Strategies for Change. New York: Gardner Press, 1988. Simmons, J. The Hidden Child. Rockville, MD: Woodbine House, 1987. Simpson, R., and Zionts, P. Autism : Information and Resources for Parents, Families, and Professionals. Austin, TX: PRO-ED, 1992. Smith, M. Autism and Life in the Community: Successful Interventions for Behavioral Challenges. Baltimore: Paul H. Brookes Publishing Co., 1990. Smith, M., Belcher, R., and Juhrs, P. A Guide to Successful Employment for Individuals with Autism. Baltimore: Paul H. Brookes Publishing Co., 1995. Barron, J., and Barron, S. There's a Boy in Here, New York: Simon and Schuster, 1992. Grandin, T. Thinking In Pictures and Other Reports From My Life with Autism. New York: Doubleday, 1995. Grandin, T. Emergence: Labeled Autistic. Novato, CA: Arena Press, 1986. Hart, C. Without Reason: A Family Copes with Two Generations of Autism. New York: Harper & Row, 1989. Maurice, C. Let Me Hear Your Voice. : A Family's Triumph over Autism. New York: Knopf, 1993. Miedzianik, D. I Hope Some Lass Will Want Me After Reading All This. Nottingham England: Nottingham University, 1986. Park, C. The Siege. New York: Harcourt, Brace, World, 1967. Williams, D. Somebody Somewhere. New York: Times Books, 1994. Prepares professionals for careers in the field of developmental disabilities. Also provides technical assistance and training, and disseminates information to service providers to support the independence, productivity, integration, and inclusion into the community of persons with developmental disabilities and their families. Provides information on speech, language, and hearing disorders, as well as referrals to certified speech-language pathologists and audiologists. An advocacy group that works toward school and community inclusion of children and adults with disabilities. Provides information and referrals to services. Publishes a newsletter and journal. Publishes "The Communicator," provides referrals, and sponsors an annual conference. Publishes the quarterly journal, Autism Research Review International. Provides up to date information on current research. Provides a wide range of services and information to families and educators. Organizes a national conference. Publishes The Advocate, with articles by parents and autism experts. Local chapters make referrals to regional programs and services, and sponsor parent support groups. Offers information on educating children with autism, including a bibliography of instructional materials for and about children with special needs. Provides professional and emotional support, as well as education and training materials to families with members who have disabilities. Collaborates with professionals and policy makers to influence national policy toward people with developmental disabilities. Serves as an information exchange for families affected by autism. Founded by parents dedicated to finding effective biological treatments for autism. Sponsors talks, conferences, and research. Federal agency providing information on educational rights under the law, as well as referrals to the Parent Training Information Center and Protection and Advocacy Agency in each state. Publishes the Journal of Autism and Developmental Disorders. Also offers workshops for parents and professionals. Provides information, support, and referrals through local chapters throughout the country. This national parent-run organization focuses on the needs of families of children and youth with emotional, behavioral, or mental disorders. Offers publications, films and videocassettes on a range oftopics related to autism. Dedicated to advancing biomedical research into the causes, prevention, and treatment of the autism spectrum disorders. Sponsors research and conferences. Publishes information for the public and professionals in helping youth become participating members of the home and the community. Provides information on Lovaas treatment methods and behavior modification approaches. This booklet was written by Sharyn Neuwirth, M.Ed., an education writer and instructional designer. An earlier draft was written by Julius Segal, Ph.D.
Scientific information and review was provided by NIMH staff members Rebecca Del Carmen, Ph.D., and Peter S. Jensen, M.D. Also providing review and assistance were Marie Bristol, Ph.D., National Institute of Child Health and Human Development; Temple Grandin, Ph.D., University of Arizona; Pat Juhrs, Director of Community Services for Autistic Adults and Children, Rockville, MD; Catherine Lord, Ph.D., University of Chicago; Gary Mesibov of Division TEACCH, University of North Carolina; Laura Schreibman, Ph.D., University of California, San Diego; Giovanna Spinella, M.D., National Institute of Neurological Disorders and Stroke; Luke Y. Tsai, M.D., University of Michigan Medical Center; and Veronica Zyst, Autism Society of America, Inc. Editorial direction was provided by Lynn J. Cave, NIMH. With grateful appreciation to the parents who freely shared their personal stories, practical suggestions, and spirit of hope.